More than 1,200 Palestinians, accompanied by Israeli and international peace activists, marched in the weekly protest in Ni’lin village on Friday, near the central West Bank city of Ramallah, marking the 67th anniversary of the Palestinian Nakba (May 15 1948). Five Palestinians were shot, and dozens more suffered the effects of tear gas inhalation. The Popular Committee against the Wall and Settlements in Ni’lin has reported that the protesters, including representatives of Palestine Liberation Organization (PLO), various other political factions, as well as representatives of National Committee of Commemorating the Nakba, the Global Campaign to Return to Palestine, the Right to Land Coalition, the Coordination Committee against the Wall, marched along with Israeli and international activist, starting at noon in the center of the village. The Nakba Commemoration started in the village with a speech by the head of the Ni’lin Village Council, Nader al-Khawaja, who welcomed both Palestinians and activists, including those who came from different cities, towns and refugee camps across the occupied West Bank, and especially the villagers living close to illegal Israeli settlements. Al-Khawaja saluted the residents of Ni’lin and their determination to continue their legitimate struggle against the apartheid wall and colonies which isolate them from their orchards. He added that Ni’lin has been holding the ongoing protest against the wall and settlements for eight consecutive years, now, embracing their steadfastness and determination to defend their lands despite the ongoing Israeli violations and excessive use of force by the soldiers. It is worth mentioning that the soldiers detained Palestinians coming from Hebron, Bethlehem and Salfit to participate in this week’s protest marking the Palestinian Nakba of 1948. The Imam of Ni’lin said in a speech, following noon prayers in the center of the village, that Ni’lin and its ongoing nonviolent popular resistance, has become a symbol of the national struggle against the occupation, and a symbol for national unity. He added that the Nakba of 1948 did not just happen and end, as it is ongoing, while refugees continue to suffer, and Palestinians continue to be targeted by Israel’s illegal occupation and colonial settlements. 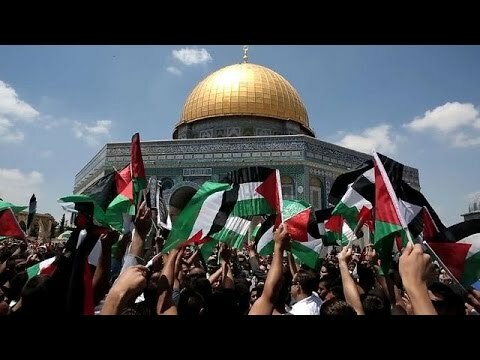 The imam called for national unity among all factions, among the Palestinian people, so that the struggle can continue until liberation and independence, and until achieving the Right of Return of all refugees. The procession then took off from the southern area of the village heading towards the Annexation Wall and the settlements that were illegally built on Palestinian lands, while the residents chanted in demand of their legitimate Palestinian rights. Israeli soldiers used excessive force against the protesters, firing rubber-coated metal bullets and dozens of gas bombs, wounding five Palestinians, while dozens suffered the effects of tear gas inhalation. The gas bombs also set fired to olive orchards and farmlands, the only source of livelihood for literally hundreds of villages. The Popular Committee against the Wall in Ni’lin said that the soldiers installed roadblocks oat the entrances of the village over the past week, in an attempt to isolate it and prevent residents from reaching it to participate in the protest, and even installed surveillance cameras on the main road and main entrance of the village. It added that dozens of soldiers were also deployed near the second roadblock, installed by the army near Palestinian orchards belonging to villages of Ni’lin and several nearby villages.